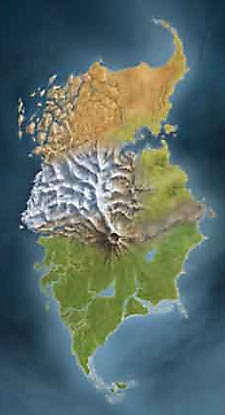 Once a paradise, the island of Mata Nui has become a place of darkness and fear, ruled by the deadly Makuta. Now six mighty heroes, the Toa, have come to gather Masks of Power and challenge Makuta. 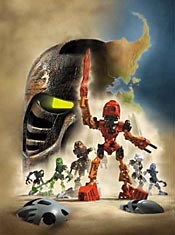 Explore the island... learn the legends... and begin to solve the mystery of Bionicle. A few years ago, Lego rolled out a new series of Technic sets called Throwbots. Each had its own theme, such as stone, ice, or electricity, and could be rigged (with no small amount of difficulty) to pitch little plastic disks around the room. The line was a moderate success, but can still be found on the shelves today. From there they moved on to Roboriders, which were sort of like automated fighting motorcycles. Weird, and again, still languishing on shelves. Pushing their fighting robot theme a bit further, Lego has now created Bionicle, which sees more human-styled robots running around trying to collect a series of masks and fend off the advances of Rahi, wild creatures which have been possessed by evil. This series is a bit of a departure for Lego, being the first line (other than Star Wars, of course) to be built around a specific story, and also marks the company's first major foray into cross-promotion. Besides the robot sets themselves, there's a collectible card game, CDs, an upcoming videogame, a comicbook, enemies, allies, and even a built-in challenge. Each of the Toa (the main heroes of the series) comes with one Kanohi (mask of power) which will help them in their fight against the evil Makuta. However, in order to defeat him, all six Toa must collect each of the six great masks, which means there are 36 different masks to find in the main set alone. Add six Turaga (high priests/sidekicks), each with six masks of their own, and you've now got 72 items to buy. Sounding collectible yet? Well, what if the sidekicks' masks are also available in the heroes' colors, giving the big guys 12 masks each to find? Lego sells Mask Packs, which contain one robot head and two random masks - you can't see what you're getting without opening the package. So now you've got 84 masks (plus a few extra "infected" masks - which turn the wearer to the side of evil - or some even rarer masks, such as metallic-colored offerings), two of which are inside this sealed box. If you're lucky, you get two masks you didn't have before. If not? Well, back to the store, let's buy another box; heck, they're only $2. And there lies the insidious strength of Lego's new campaign; affordability. When you've got a wide variety of sets to collect, you don't want to have to pay exorbitant amounts for them. The heroic Toa are selling for just under seven dollars, the sidekick Turaga for about three, and the mask sets for two. But even at these low prices, the money adds up quickly for Lego, while not seeming such a blow to the consumer. So Lego has created a collectible toyline that involves a bit of challenge and dedication. It's got good, varied characters (allowing buyers to pick their favorite if they're not interested in the entire set), well-thought out storylines, and both good and evil forces. Customers are willing to pay for the reasonably-priced sets, and may be inclined to pick up some of the upcoming multimedia peripherals. Bionicle can be found both in specialty shops and larger chain stores, so everyone has a chance to get them. All in all, it sounds like a winning idea; I just hope this line sells better than its two predecessors. Me, I'm all for it - my Bionicles are currently my favorite toy, and I recommend picking up a set and giving it a try.